Creme-filled chocolates are perfect for Valentine's Day. Isn't it great that two holidays happen on the same day? If your sweetheart has a sweet tooth, don't forget to treat your loved one something special. Did you know that there was no such tradition as giving a box of chocolates to the loved ones on Valentine's Day before the second half of the 20th century? The first boxes of chocolates contained just little round creme-filled chocolates. 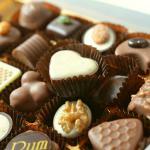 Today the chocolates can have different shapes, but hearts are the most popular for the holiday. Whether you buy a box of creme-filled chocolates for you loved one or for yourself, enjoy the rewards of today's food holiday, even if you don't celebrate the Valentine's Day.